Think of it. A free education. He is thinking of it. Not for him; no, he learns by teaching. Bill Gates has seen to that. No, Sal is going to try to teach the world, for free. Only the self-educated are free. 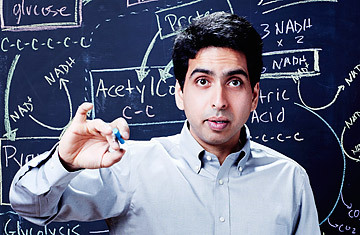 ‘Like many innovators, Sal Khan rethinks existing assumptions and imagines what education could be if freed from them. And his core idea-liberating teachers from lecturing and state-mandated calendars and opening up class time for truly human interaction-has become his life’s passion. Schools seek his advice about connecting to students in a digital age, and people of all ages and backgrounds flock to the site to utilize this fresh approach to learning. How both students and teachers are being bound by a broken top-down model invented in Prussia two centuries ago. Why technology will make classrooms more human and teachers more important. How and why we can afford to pay educators the same as other professionals. How we can bring creativity and true human interactivity back to learning. Why we should be very optimistic about the future of learning. Masterminds are best at analysis. Sal has analyzed the educational system and found it lacking… big time. In late 2004, Khan began tutoring his cousin, Nadia, in mathematics over the internet using Yahoo!’s Doodle notepad.When other relatives and friends sought his tutoring, he decided it would be more practical and beneficial to distribute the tutorials on YouTube where he created an account on 16 November 2006. 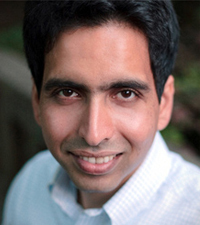 Their popularity on the video sharing website and the testimonials of appreciative students prompted Khan to quit his job as a hedge fund analyst in late 2009 to focus on developing his YouTube channel, Khan Academy, full-time with the aid of his long time friend Josh Gefner. Previous Article As Did the Dissimilarity..